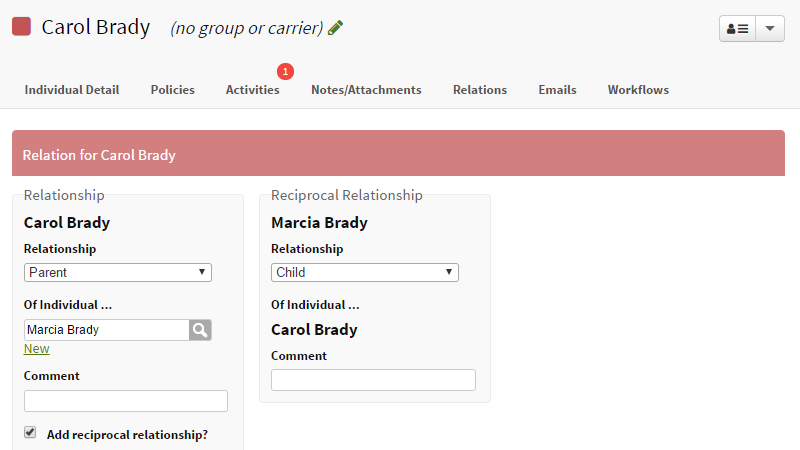 We’ve made some updates to help you better track individuals and their relationships or dependents. With the update, some may notice that individual relationships look flip-flopped. If this is the case, we’ll help you take care of it. So before you get started, check out the notes below and then feel free to contact us; we’re here to help. If you work with individuals in health and life insurance, keeping track of their relationships and dependents is vital to your work, whether you are trying to answer the question of who’s covered in a family or how much life insurance to suggest based on an individual’s needs. Relationships have been updated to improve readability and be more straightforward. Also, you can now use either an individual record in your account or just add basic individual info as text - hooray! Here are a few details about the update that will help you keep track of individuals and their relationships. With the update, working with relationship data is now more straightforward and provides better overall visibility. You’ll also notice that the Relations area is now called Relationships. Along with that, you’ll notice that the direction of the relationships has changed (what we’re calling the switch or the flip-flop). We’ve done this to help show data how the insurance industry reports on relationships and dependent data. 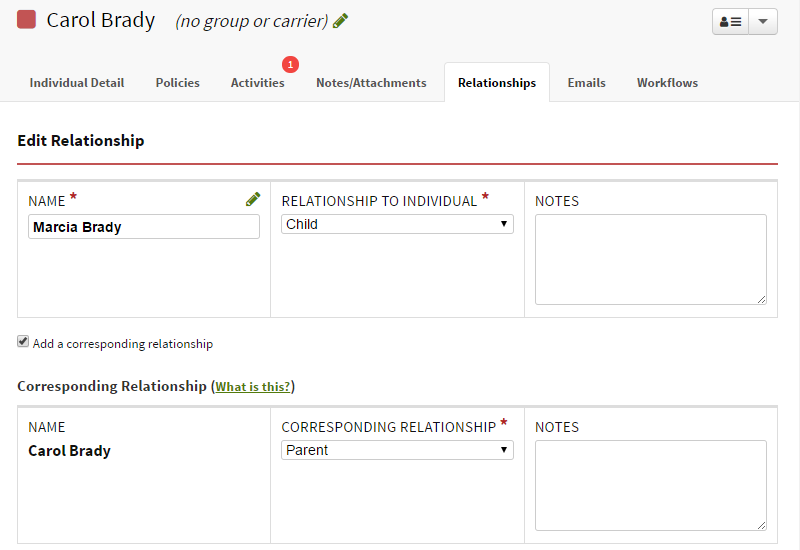 As an added bonus, you can now see the relationship type listed in the Individual Summary and can run a report of individuals and their relationships. For example, let’s say we are viewing the individual record for Carol Brady who has a daughter Marcia Brady, who is just one out of the bunch. Marcia, Marcia, Marcia. Previously, a relationship was displayed as Carol Brady Parent of Marcia Brady. With the update, the relationship displays as Carol Brady has a child - Marcia Brady. Here’s how Carol’s record would look showing the whole bunch. Previously, when you added a relationship or dependent, they needed to exist as an individual record in your account. You’ve said that this can be time consuming or make it challenging to search or report on data in your account. With this update, you can use either an individual in your account or just add basic individual info as text. Of course, when you need to, you can save the basic individual info into an individual record. Also, when you go to add a relationship you previously had the option to add a reciprocal relationship. 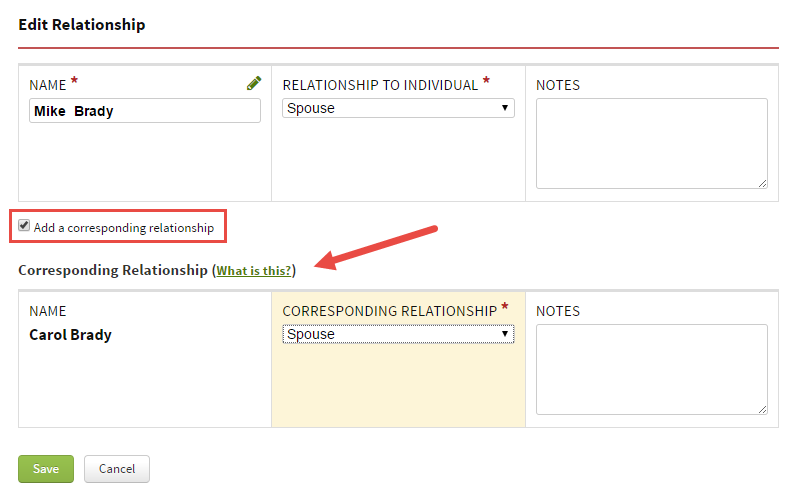 With the update, as you are adding relationships to an individual, you can add a corresponding relationship. Corresponding relationships let you create a relationship with the other related individual at the same time. Please note, each relationship is stored separately on each individual. Find out more about Adding/Editing Relationships. As you work with individuals and add relationships, you may need to make changes over time. Such as merging, updating, or adding relationships types. 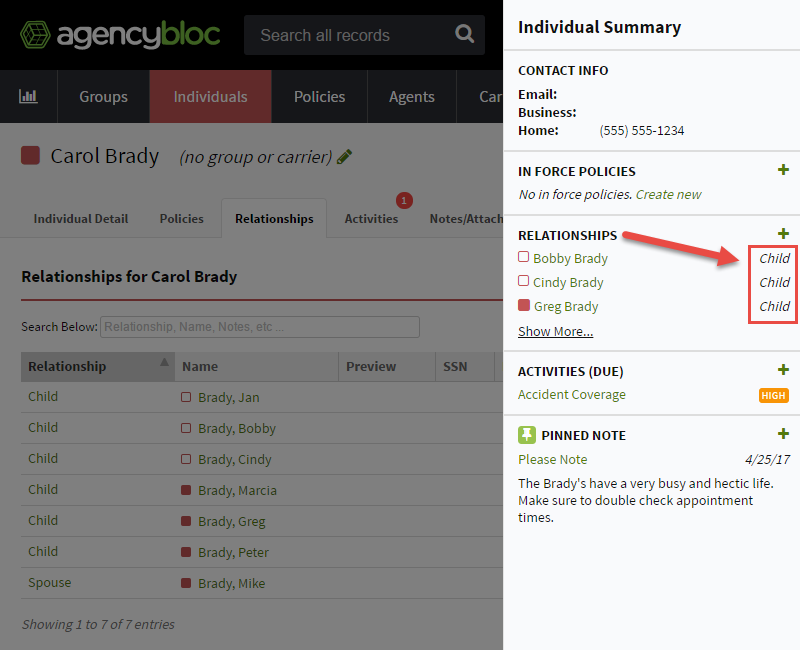 Also, you can now add insurance industry standard relationships to use in your account. Learn more about Managing Relationships. In the case of Carol Brady and Marcia Brady, it would look pretty odd to see Marcia listed as the parent of Carol, like some upside down universe. So, we’ve got a couple of things we can do to help you turn the upside down right side up. You can merge one relationship type to another. For some, this simple step may do the trick. For others, you may need to switch the relationships - which we will help you out with. So in the situation where your relationships look backward after the update, before you do anything to straighten them out, contact us and we'll help you out. Get help with Fixing Switched Relationships. Let us know what you think about the update. Also, if you need anything, just let us know, we're here to help.